The French ministry of Defence has announced that three members of French security forces were killed in a helicopter crash in Libya. A spokesman has also admitted that special French forces are on the ground in the country. The confirmation about the helicopeter crash follows a similar statement to that effect by French President Francois Hollande. The French authorities have not said, however, where the crash occurred or when. It is being widely assumed, nevertheless, that the crash was the one on Sunday near Magrun, some 70 kilometres south of Benghazi. At the time, the Benghazi Defence Brigades (BDB), which claimed to have shot down the Magrun helicopter with a Sam missile, said that there were four people on board: two Libyans and two foreigners. That, though, was denied by the the Libyan National Army (LNA) which said that the crash was the result of a technical problem and that all four people on board were Libyans. This morning, the commander of the LNA’s Benghazi operations room, Colonel Abdussalam Al-Hassi, reiterated those denials, insisting in a TV interview that no French military were on board the Magrun helicopter. However, adding to the confusion, the LNA now speaks of three people on board the downed flught, not four. They have been named as Omar Drissi (pilot), Boubacar Hassi (co-pilot) and Fathi Warfali (a flight technician). If the three French military officials were on the same helicopter, that would make six on board. According to reports in Paris, the three were not members of the French army but intelligence officials with the Directorate-General for External Security (DGSE). 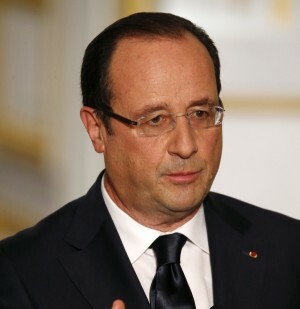 President Hollande alluded to this in his statement, saying that “we are carrying out dangerous intelligence operations” in Libya and that three soldiers, “who were involved in these operations” had been killed in the accident. Commenting on the deaths, French government spokesman Stéphane Le Foll, confirmed that French secret services are operating in Libya. “Yes, special forces are there”, he told French broadcaster France Info. They were there, he said, “to help and to make sure France is present everywhere in the struggle against terrorists”. Despite earlier widespread allegations of French forces being in Benghazi and collaborating with the LNA since May, France has not made any statement until now about having a military presence in Libya. It did, however, admit to air surveillance to find out what is happening on the ground. As well as the French, there are reports of British and Italian military observers in Benghazi, as well as Emirati forces, and most recently Russians. The British are also said to be present in Misrata, helping the Bunyan Marsous operation room in the fight against Islamic State in Sirte. The French are also known to have anti-terrorist forces operating in the south of the country but based across the border in Niger, although President Hollande had previously denied it.